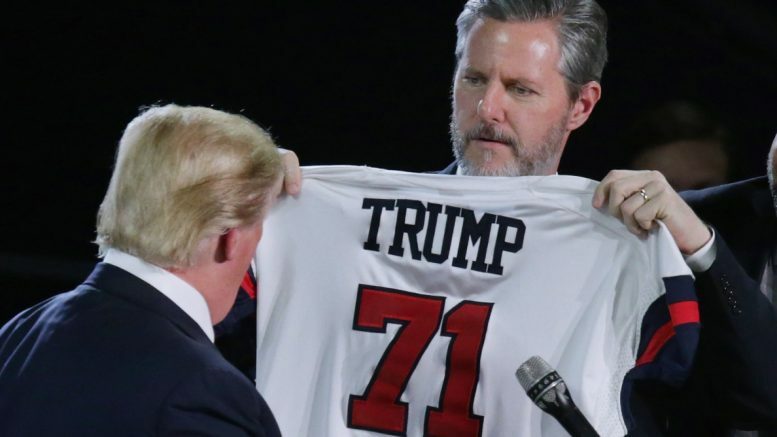 LYNCHBURG, VA - Liberty University President Jerry Falwell, Jr. presents Republican presidential candidate Donald Trump with a jersey after he delivered the convocation in the Vines Center at the university. Liberty University President Jerry Falwell, Jr. has recorded a new radio ad for the Donald Trump campaign, just days before the Presidential election on November 8. The ad opens with Falwell introducing himself and asking listeners to join him in supporting Donald Trump for President on November 8. He then goes on to quote Mark 12:17. Falwell closes by asking Christians to join him in standing up for “freedom and our shared Christian values,” by voting for Donald Trump. This is also not the first radio ad that Falwell has appeared in for Trump. In January, the Trump campaign featured Falwell’s comments praising Trump in a 60-second radio ad that ran in Iowa and South Carolina. That ad used short clips from Falwell’s introduction of Trump at a Liberty University convocation. While Falwell has been outspoken about his support for Trump, other evangelical leaders have been outspoken in protest of his support.